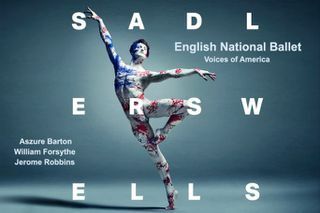 Sadler’s Wells Associate Company English National Ballet returns with a programme of works packed with the audacious attitude of American-style neo-classical ballet, featuring two works by one of dance’s leading figures, William Forsythe: the world premiere of a new work created for English National Ballet and Approximate Sonata 2016, a series of pas de deux deconstructing the vocabulary of classical ballet, to a score by Thom Willems. The bill also includes Jerome Robbins’ arresting tale of unstoppable predatory instincts The Cage, set to Stravinsky’s Concerto in D, and a reworked version of Aszure Barton’s Fantastic Beings, accompanied by Mason Bates’ dynamic score performed live by English National Ballet Philharmonic. Voices of America - ENB is not available to book, please sign up to our newsletter for updates and offers on forthcoming and available shows.